This past Sunday, I “hiked” the halls of the Donald E. Stephens Convention Center to peruse the offerings of Adventure Travel Expo vendors. I got some great info on hiking, biking, rock climbing and white water rafting around the country and the world. I plan to tell you more about some of these great adventures in future blog posts. Today, I wanted share the news about an exciting local shop: The Scuba Emporium. Mark Linse, one of the Scuba Emporium’s Scuba Diver Trainers, was on hand with a few other staff members to answer questions about scuba diving and, near and dear to my heart, Snorkeling Certification (aka Skin Diver certification). Mark’s lovely wife, Laura Linse, and team member, David Hoitsma, are also Dive Instructors at the Emporium and shared their enthusiasm and adventure travel stories with us. I love to snorkel when I visit warmer waters of the world. but Mark and his team told me that one of the best places to scuba dive is in…Lake Michigan! Apparently, there are many “wrecks” in the lake and this attracts interesting mollusks and other lake creatures. More info on Scuba Diving in the Great Lakes here. Mark also told me that it’s recommended to wear a snorkling “vest” when you snorkle so that you can inflate it if you get caught in riptides. The vest will allow you to stay above the water level so you can breath while trying to swim back to shore. Which would have been great to know when I was snorkeling in rough waters of Costa Rica a few years ago! These tips and many others are part of the Skin Diving Certification at Scuba Emporium. Cost About $50 for 2 hours of training. I think that’s not a bad price to pay to help save my life the next time I snorkel! 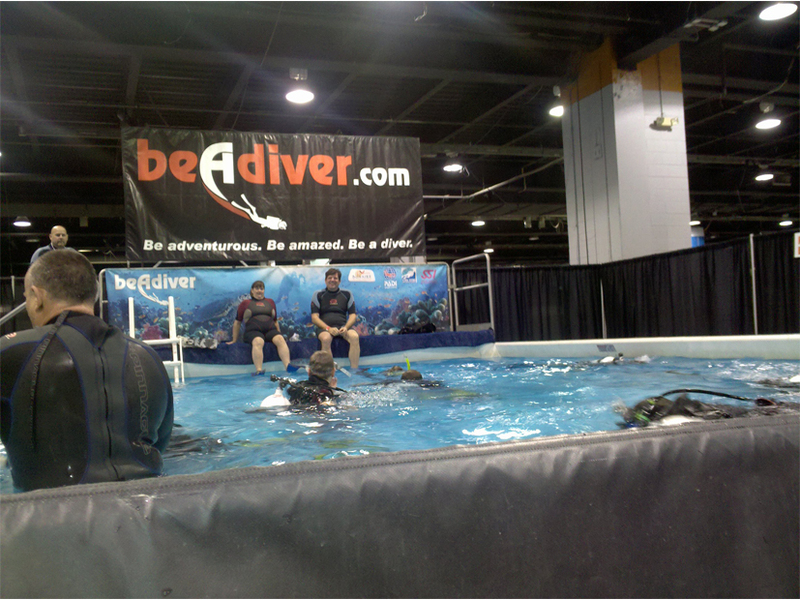 Scuba Diving Training at Adventure Travel Expo 2010-Be a Diver! As a subprogram of the PADI Open Water Diver program, the PADI Scuba Diver rating allows you to get certified quickly and easily by minimizing time constraints. With the PADI Scuba Diver certification you can dive under the direct supervision of a PADI Divemaster, Assistant Instructor, Instructor or higher professional on your next vacation or dive trip. cost: $127-200 depending on when you take the course. For more information about this course, click here. 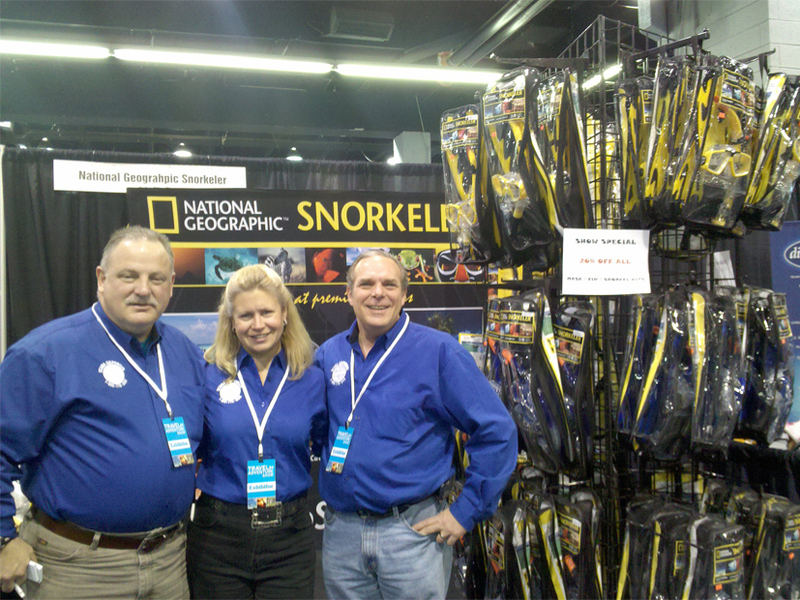 In addition to lessons, the Scuba Emporium also sells a large variety of scuba and snorkeling equipment. Proper fit of masks and equipment is important, and the experts here will help you find the best equipment to fit your body and face.